I confess I’m not sure how to tell this story, though I’m sure it must be told just as I’m sure it must be read. To begin you should also know that I’m positive that kind, generous, moral and ethical dog people far outnumber the bad eggs. So, that’s not where this story leads, to the denouncement of dog clubs or dog people, even though it is about a few dog people who behaved badly. People who continue still today, behaving badly toward a fellow club member. People who would harm an innocent, unselfish dog loving person. This is a true story about people who love purebred dogs. The name is changed to protect the innocent so I’m calling the story’s heroine Joy. I won’t name wrong doers, but do hope that those people just happen to read this story and recognize themselves. Maybe with any luck, some will change their behavior, for the dogs and the sport. If they don’t change, maybe some of you will call them out when you witness their bad behavior. Maybe together we can force a little change for good, stifle bad behavior in our rank. Many love affairs begin by chance, a serendipitous event that changes the direction of our lives, melts our hearts and brings us joy. A walk in a field leads to the recovery of a stray dog brought home to safety and shelter. When the stray’s owner isn’t found this happenstance blossoms into a love affair with the breed because the stray had stayed, becoming a beloved pet. Two is better than one as all dog lovers know, so Joy acquires a second puppy from a well-known dog show exhibitor and breeder. The typical contacts between breeder and pet owner carry on in the early part of puppy’s life, but those contacts dwindle to nothing as both go about their busy lives. The years pass with little contact between these two casual acquaintances, Joy and the breeder. Joy commits herself to supporting her breed by joining dog clubs, her breed’s parent club and a couple of the local breed clubs. She contributes time and financial support to rescue efforts and serves as an officer for a local breed rescue. Joy is one of those members fondly referred to as a pet owner. She is one of thousands, heck maybe millions of pet owners who support AKC parent clubs. Not being involved in dog competitions, Joy is blissfully unaware of the political maneuvering, power mongering and gossip that occurs among that group. She knows nothing of the fighting and controversy that can darken AKC dog sports. Because dog club leaders are often selected from among people who participate at AKC dog events, they sometimes bring their competitive penchants and accompanying power plays along impacting the leadership of a club. Rarely, if ever, is a pet owner included among the ranks of parent club leaders. Rarely, if ever, is a pet owner aware of the controversy or competitive power plays among club leaders. When Joy reads a blurb in the club newsletter seeking a qualified member to fill an officer vacancy, she recognizes that she owns the skill-set needed to fill the job. Wanting to help, she volunteers. Joy had no attachments to any individual, had no preconceived notions, and had no contact with any of the leaders. Joy had no dog in any fight, so to speak. Joy is simply a pet owning member of the club, enjoying life with her dogs, unaware that any controversy existed in her club. Joy just happened to notice that work needed done for the club and she was willing to offer her help. Joy was a pet owner, unaware of back channel politics, power mongering and gossip. She innocently volunteered. When called upon she joins the club’s Board to fill the vacancy. Joy believed she’d been asked to join a group where each held the commitment that what was said and done would be about taking care of the club and giving back to the dogs. If only this were a fairy tale and not a true story. In a fairy tale moral acts would prevail. Joy would marry the prince and together they would rule over the people with dignity, grace and justice for all. The village would stand united while puppies run happily through fields and the children laugh and play. And, there’d be sunshine, and rainbows and unicorns…yes, let’s have some unicorns too. This story actually happened though, so we face the reality that some people do behave badly. In a true story a white knight doesn’t ride in to save the princess, because sometimes, in a true story, people cave to their own self-serving mission declaring it for the greater good. They mislead, they lie, and they distort the truth to achieve their personal mission, to serve themselves. Their allegations are false but repeated anyway to any who will listen. Unrest is sewn with lies stitched into stories whispered mouth to ear. Their personal mission is crafted to harm, to sew unrest, to lead the villagers, pitchforks in hand to the castle to unseat their enemies. Harm is done merely to serve the selfish needs of a few. So, a few people, needing to drive controversy, depict Joy, a selfless volunteer, as a political pawn. They tell this story because they think, they don’t know as a fact, they only think she’s consorted with others. Their stories, their false allegations and their lies are spread among members to cause harm to Joy and controversy in the club. ­­Now mind you, Joy isn’t aware that her integrity is under attack, and most certainly doesn’t know that nasty gossip about her is spreading rapidly among the members. A few club members, acting out in a wicked way have twisted the motive behind Joy’s selfless act simply to create drama that would promote their own personal agendas. Joy doesn’t know about the gossip channels used by exhibitor members, she’s a pet owner who goes about her work unaware of this behind the scenes plot. Why did they choose to focus an unprovoked attack on Joy? Why was Joy singled out, dragged through the mud and into the midst of a controversy she never knew existed? The connection they used to craft their lies, the one and only small shred of truth in all that story telling was that once, years ago, Joy acquired a puppy from one of their targeted foes. That’s right, they aimed an attack at Joy because she once acquired a dog from a person they believed was their nemesis. Wouldn’t it be grand if I could tell you the mean-spirited garbage and gossip ended there? Sure, there was some dirt thrown about, but our Joy, even after learning about their attack, ignores the fracas and goes amicably about her work supporting the club. Wouldn’t it be nice if it all stopped there? If there was no more harm, no more fouls? Nope, didn’t happen. Joy, who never meant nor caused harm to anyone in any club, is still under attack today by a few exhibitor members, those who do so love to stoke controversy. She continues to receive derisive emails ladled with snide remarks from those who simply want to hurt her. Some people still gossip when they’re in a group, and she’s often a target of their gossip. In my eyes Joy is a heroine. Joy is strong, intelligent, kind and giving. Joy is a dog lover devoted to giving back to our canine friends and her club work is truly motivated by her devotion to the dogs. Joy won’t allow petty human antics to affect her, nor would she ever stoop to such tactics. Joy lives by the creed that for dog clubs to survive and breeds to flourish we shove all that human nastiness firmly aside, choosing instead to enjoy time devoted to productive activity shared with the kind and compassionate dog lovers who are are abundant in our clubs. From the February 2014 issue of Dogs in Review magazine. The delegate is supposed to represent his or her dog club to the AKC, but that’s only half the job. This tongue in cheek essay from Dogs in Review magazine will give you an all around look at the job and bring a few smiles along the way. From the age of five I have been going to dog shows. Since then, I have organized a university outreach course on canines, served as president of an all-breed club and of the Clumber Spaniel Club of America, and been show chair, but until I became the AKC Delegate for my local all-breed club 12 years ago, I didn’t really have a clue as to what that really meant. So I thought it might be of interest to others in the dog world to try to explain what it’s all about, with the good and the bad. There are about 5,000 AKC kennel clubs in the United States, of which only about 600 are official member clubs, entitled to elect a delegate, and thus supposedly have a voice in the organized dog world. The other kennel clubs are simply licensed to give shows, etc., but are not represented. It’s a big deal to be a member club and involves fulfilling a number of requirements (mainly size, continuity, breeding and shows). The Clumber Spaniel Club of America was founded in 1972, and it took us 17 years and a lot of paperwork to finally be approved in 1989. The delegate is supposed to represent his or her dog club to the AKC, but that’s only half the job. The other half is to represent the AKC to one’s club, and given the present AKC, that’s not always a pleasing task. About 80 percent of delegates serve long-term and can help serve as informal institutional memory. The delegate is expected to give regular reports on official (and unofficial!) AKC doings. How do we know what to report? As many as two emails come each day with what AKC wants us to know. Also there is an online magazine by delegates for delegates. To learn what AKC doesn’t want us to know, delegates get to meetings early and stay late, and listen to the “old-timers” with 20 or more years as delegate. But WARNING! It takes essentially three elements to be a delegate: a passion for dogs, plus time and money. The passion for dogs is probably what we share the most. Time available varies with each of us, but money is something else. It’s not cheap being a delegate. In addition to airfare, hotels and meals, there are the two days off one’s job, kenneling, gas, airport parking, van to the hotel and other travel expenses. Most clubs contribute $200 to $250 per meeting, which is at best one-third of the actual costs. Very few clubs pay all delegate expenses, and some delegates pay all expenses themselves so as not to be a burden on the club’s precarious finances. But as the old joke goes, you can actually get rich being a delegate! It takes a good thumb, a bag of cheap peanut butter sandwiches and a good supply of old newspapers. The thumb is for hitchhiking cross-country, the sandwiches for food and the newspapers for warmth at night sleeping on a park bench. Then you invest the money your club gives you and get rich! There are four meetings a year, all on the Atlantic coast. You probably think AKC stands for American Kennel Club; in my opinion, it stands for Atlantic Kennel Club. There are executive offices in New York City, operational offices in Raleigh, North Carolina, and meetings held in New Jersey, North Carolina and Florida. So reflect on that, especially if you live in Kansas, not to mention California, Oregon, Washington, Alaska or Hawaii! Another problem: Some parent clubs schedule the national at exactly the same time as the important election meeting in March. Once elected and having gone through the 3-month AKC approval process, you go to your first meeting. (One can represent only one AKC club at a time, and when I was elected delegate for the CSCA, having already served as a delegate for my all-breed club for 12 years cut no ice.) If this is really your first meeting, it looks like organized chaos. There are about 400 of the 600 delegates typically present at a given meeting. All are running around in the same big hotel, attending myriad committee meetings and one huge general meeting. It’s so bad that at your first meeting they hang a sign around your neck that says, “FIRST MEETING,” so people will take pity on you. And you are assigned an official mentor, normally someone in your breed. Meetings are rife with unwritten rules, dress codes, etc. Also you have to be formally introduced on the floor at your first general assembly meeting with a résumé of your dog activities, normally by someone in your breed. Meetings are held on Mondays and Tuesdays (helps keep out the working stiffs!). On Monday there are individual committee meetings (e.g., parent clubs, all-breed clubs, canine health, dog show rules, obedience, herding, coursing and so on). Many take place at the same time, so you have to choose. Each committee has an elected board. To be elected, one presents an unblemished attendance record for hopefully 200 years and great dog activity. The committee board members sit at the head of the room and officiate. Any delegate can attend any committee meeting but can be heard only after the board members have had their say concerning the agenda. At the end of this first day there is a big general meeting with no agenda, so anything worrying people can be brought up and discussed. None of the professional staff are to attend these Monday meetings, except by special invitation. It’s just delegates talking to delegates. Monday evening is a cocktail party, and later it’s a good time, especially for people in the same breed, to have dinner together and talk dogs. Next we all adjourn to a large dining room for a nice luncheon, compliments of the AKC. This is a good time to meet other committed dog people, but the conversations are soon interrupted by Dennis tapping on a glass and endless awards, interspersed with dutiful clapping. Then unless any items on the morning’s agenda still remain, we turn in our badges and go our separate ways. References for more information on the Delegate role visit the AKC website by clicking the link below. 2018 GSCA National Specialty Important Deadlines! Information for the online ordering of RV parking spaces can be found at http://coyoteclassic.org/Exhibitors/GSCAParking. The opening date is 3 September at 5PM PT and the closing date is 22 September at 5PM PT. Please note that the dates are firm on opening and closing for this information. We are being granted the opportunity to do this BEFORE the site opens for the Coyote Classic regular all breed shows. We have spaces in several different lots to meet various needs and requirements. Any questions regarding RV parking should be directed to parking2018@coyoteclassic.org. Box van parking information is at http://coyoteclassic.org/Exhibitors/GSCABoxVan. You may view the map and ordering process now. The opening date is 3 September at 5PM PT and the closing date is 22 September at 5PM PT. Please note that the dates are firm on opening and closing for this information. We are being granted the opportunity to do this BEFORE the site opens for the Coyote Classic regular all breed shows. Any questions regarding box van parking should be directed to parking2018@coyoteclassic.org. Several RV and trailer rental companies/contact information are listed on the NS website (http://gsca2018national.com/trailers/rvs.html). Important! If you rent a unit, you will still incur an additional daily site fee through Pima County Fairgrounds.You must make the site reservations. Indoor reserved grooming spaces with electric are 10 X 10 feet and located in the Old Pueblo Hall on a first come, first serve basis. If you want to be next to someone, please do the reservation together. The grooming space reservations are all being done online at http://coyoteclassic.org/Exhibitors/GSCAGrooming . Free grooming space will be made available under the Pavilion. At no time may electrical be used in this area or any area under the Pavilion. If you do use power, you will be asked to leave. Grooming space questions should be directed to Pat Boldt, Event Coordinator at mpboldt@aol.com. All exhibitors are encouraged to bring their own extension cords and splitters. I enjoyed this look back to the 1930’s and a scandalous battle between the AKC and an editorial writer, hope you do too! Published by The Canine Chronical and linked below. It may seem unbelievable, but at one time AKC often shared detailed information about its legal wrangles. Transcripts, depositions, and trial verdicts were published in the AKC Gazette. Needless to say, this was never an official policy and there was no altruistic motive attached to these uncharacteristic episodes of transparency. AKC did it to make a point. 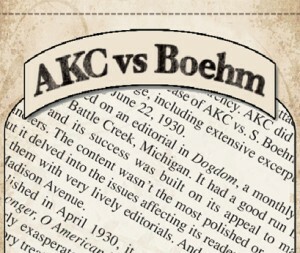 A good example is the case of AKC vs. S. Boehm. It merited three months of coverage, including extensive excerpts from the trial board hearing June 22, 1930. It centered on an editorial in Dogdom, a monthly publication based in Battle Creek, Michigan. It had a good run from 1900-1941, and its success was built on its appeal to mainstream fanciers. The content wasn’t the most polished or professional. But it delved into the issues affecting its readers, often showcasing them with very lively editorials. And this one hit a nerve at 51 Madison Avenue. Published in April 1930, it was provocatively titled How Much Longer, O American Kennel Club. The author, S. Boehm was clearly exasperated by AKC bureaucracy- specifically its contradictory treatment of fanciers, skyrocketing fees, and endless fines imposed for dubious infractions. It wasn’t the first, last, or worst journalistic denigration of AKC management. But this author was also a breeder/exhibitor with 16 years in the game. Speed may not exemplify every AKC action, but they were on this immediately. Boehm headed the list at AKC’s next Executive Committee Meeting. The writer qualified that remark, saying that registrations were the only benefit he’d derived from the organization – and he paid for this service. He specifically questioned why small specialty clubs were charged $50 licensing fees, a considerable sum back then, and receiving no tangible benefits in return. Admittedly, Boehm’s tone verged on volatile, but he raised timely issues. They were especially pertinent to West Coast fanciers who felt completely disconnected from AKC. Boehm wasn’t the only fancier baffled by its contradictory policies and erratic enforcement of rules. Pointing out that some violations received draconian penalties, while others were ignored; he added that many infractions resulted rampant clerical errors by AKC staff, a fact that never seemed to merit consideration. He made rather blunt comparisons between dictatorial government regimes and AKC’s autocratic manner. Even so, by today’s standards, Boehm’s rant seems tame. But AKC was determined to discourage similar journalistic criticism. They retaliated. Then as now, AKC never suffered a lawyer shortage. When presenting the matter to Gazette readers, they repeatedly emphasized that, “The trial was based not upon the defendant’s criticism of the AKC, but on statements that appeared in Dogdom.” The relative impartiality of AKC trial boards remains a perennial source of debate. In this case, the Los Angeles Trial Board consisted of Al Christy and John Sinnott, chaired by Freeman Ford. They utilized the classic defamation strategy of proving that Boehm’s statements were false and therefore legally actionable. That was obviously the point AKC sought to illustrate when they published this transcript. However, it revealed much more than they bargained for. They requested that Boehm submit evidence supporting the veracity of his statements. That pretty much set the pace for this candid, sometimes comical, documented exchange. More than once, the testimony veered into that discomfort zone about the vague parameters that separate defamation, justified criticism, and the constitutional right to free speech. They sensibly avoided suggesting that Boehm had malicious intent, instead accusing him of inadequately researching the issue before launching his editorial blitzkrieg. Another witness, Dr. Frank Porter Miller of Los Angeles, admitted that some rules were needlessly complicated and could seem unfair, “when a specialty club puts on a show of 11 dogs and pays fifty dollars… the article was a little raw, a little bold, but primarily there was a lot of truth in what was said… we should not condemn the opinion of a man.” Then as now, AKC rules were constantly revised and amended, and constituents often had trouble following the plot, especially since AKC did not publish a complete set of rules until November, 1932. In September the Gazette ran another lengthy editorial. “Since the Boehm case, the American Kennel Club has received an astonishingly large number of letters complimenting the Club upon the verdict.” However, the surprisingly conciliatory tone suggests that those letters touched on a few more issues. Rather than rattling sabers, they brandished an olive branch. Entitled An Invitation to the Press, it stressed AKC’s commitment to transparency. “Without thorough knowledge, no one can write with intelligence upon any subject. Take the American Kennel Club for example.” It goes on to say that few writers bother to ascertain the facts. “As a rule, he knows very little about the problems that confront the American Kennel Club and its officers. Quite often, he knows very little about dogs. Still, he plunges eagerly into the subject, and offers a lot of suggestions and changes that he believes will be beneficial to the sport, but in reality, are impractical and impossible in operation.” That observation is equally valid today. Misinformation in the mainstream media has fostered a deep rooted and possibly irreparable anti-AKC bias. AKC eventually reconsidered its harsh verdict against Boehm. His privileges were reinstated and, somewhat paradoxically, he carved out a successful career as a Gazette feature writer. As predicted, registrations soon passed that fateful milestone of one million in 1935. That lucky dog, a Sheltie appropriately called Sheltieland Alice Grey Gown, and his owner, Miss Catherine Edwards Coleman, attended a grand ceremony at AKC headquarters to mark the occasion. It took half a century to reach that goal, which obviously wasn’t sufficient time to improve procedures to handle the volume of business. Nor did that happen during the next two decades as registrations surpassed five million. By then, AKC was immersed in phenomenal post-war growth. Annual registrations exceeding one million became routine. Since then, AKC has continually overhauled and streamlined procedures to achieve their time honored goal of efficient customer service. A century later it still seems perpetually out of reach. Although its overall growth has slowed, in my opinnion, AKC never ceases to revise the map with new breeds and events – and endlessly changing rules. I think Boehm would likely cringe to see the current complexity of regulations governing AKC participants. This information is certainly more accessible, but to me that’s the upshot of internet technology rather than any drastic revisions in AKC philosophy. As always, it seems its commitment to transparency waxes and wanes along with the mood of the board. This might not ease your concerns about AKC management. But keep it in mind the next time you feel completely frustrated about your slow progress toward a personal goal. One of the things we almost never talk about is the personal safety of our exhibitors. We are constantly On The Road Again, flying into strange cities, driving to new locations. Some of these journeys, and even show sites, are in sketchy areas, at best. A significant number of us are traveling alone through all of it. Our sport also features a unique mix of ages, genders and positions of power that have been known to be abused. With that in mind, we offer our “Five Best Tips for Safety” while traveling. And, as a bonus, “Best Practices for Handling Inappropriate Advances.” Obviously, much of this advice applies anywhere, anytime. Ray Helmken, retired from the Honolulu Police Department and Akita fancier; along with GWP lover Guy Miner, owner of GMM Defense, who offers self-defense courses for small groups, provide these insights. 1. Stay alert and aware. Pay attention to your surroundings. If you want to check Facebook or send a text, do it from the safety of your locked vehicle. Wandering aimlessly into a rest area bathroom while staring at your phone sets you up for someone to take advantage of your distraction. Body posture has a lot to do with how the bad guys choose victims. Head up and watchful, shoulders back, strong core and purposeful movement is our first line of defense. 4. Stay in touch with family/friends. Someone should always know your route, intended destination and ETA. Always have a travel buddy you check in with when you stop for the night. This sets up a built in alarm system — if you don’t check in, your buddy should check up on you. As disappointing and upsetting as it is, inappropriate touching or advances are not confined to billionaires and Hollywood starlets. From copping a cheap feel to offering hotel room keys, and worse, it does happen, even in our sport. Your momma was right when she told you to make good decisions and use your common sense. Gracefully extricating oneself from an awkward or even ugly situation is much more difficult than avoiding it in the first place. There is safety in numbers. Don’t allow yourself to be singled out of a group in social settings. Everyone has a slightly different comfort level of what is “harmless” and what is not. Be true to yourself. While it’s pretty to think that in today’s society people know the boundaries of what is and is not acceptable, each and every one of us need to be able and willing to say, “Back off” if a line is crossed. In the Year of Living Well, stay safe, stay aware and stand strong. Our family always had dogs. Mutt dogs, purebred dogs, but always dogs. I grew up with dogs everywhere. My mother eventually enrolled me in dog care 4-H because I was “shy and retiring and lacked people skills”….. I am the living testimonial to the success of the 4-H program! I continued into AKC shows as my family transitioned from “dogs” to the wonderful world of Purebred Dogs. I showed all of our family dogs in conformation and participated in Junior Showmanship competition. I went to college, earned a degree and worked as a newspaper reporter and freelance writer. Today, Today, I am an AKC Breeder of Merit, a member of the Professional Handlers Association and the host of pure dog talk http://puredogtalk.com/, THE podcast about purebred dogs. Are You Ashamed to Admit to Being a Dog Breeder? Sharing this well written article written by Elizabeth Brinkley and published in Best in Show Daily. Click the title of the article for the link to the original publication. If so you aren’t alone. In the past 30 plus years, the relentless propaganda of the animal rights movement has presented dog breeders in a very negative light. They have brainwashed the public that there is a “pet overpopulation” and that every puppy bred by a breeder “kills” a shelter dog. Nothing could be further from the truth. It is time for breeders to stop hiding, to be proud of what they do and stand up for purebred dogs. Educate the public with the TRUTH about breeding. You owe it to yourself, your breed and our sport to help. Here is some information you can share with people you meet. First fact: there is no longer a “pet overpopulation. That has been proven. For the past ten years, shelters have been importing as many as 300,000 dogs per year according to the USDA. And those are only the ones reported. Many others are smuggled across the border from Mexico or brought in by people claiming them as their pets. Shelters are importing so-called “meat dogs” from Korea. I’m sorry but I have trouble believing a purebred Maltese was being raised for a meal – maybe an appetizer? These animals are bringing with them diseases from their country of origin, many of which have never been seen in the US or had been eradicated such as rabies. There are still local shelters that have issues but the main problems with dogs in shelters is a combination of poor owner retention, poor shelter management, poor pet distribution, a lack of funds for public shelters (partly due to the siphoning off of funds by HSUS, ASPCA, PeTA, et. al with their crying, whining late night TV ads) and a lack of education of the public. Since 2005 the birthrate for puppies has not been meeting the demand. Many rare breeds are declining to the point of extinction due to anti-breeder laws Breeders can fix that. WE ARE THE EXPERTS. We need to step up and tell the public and our legislators who we are and what the animal rights groups are. Second fact: the public has the right to choose. A shelter/rescue dog is NOT for every family. Shelter/rescue dogs come with baggage that can require an EXPERIENCED owner. Shelter/rescue dogs have NO health testing and frequently have behavioral issues that take years of training to overcome. Health care and training for a shelter/rescue dog can cost THOUSANDS of dollars and still not result in a quality pet. Puppies purchased from a shelter or rescue are NOT subject to any state puppy lemon laws. Puppies purchased from a breeder or a pet store are covered under state puppy lemon laws. Obtaining a dog should be a time for rational decision making–not an excuse for moral preening. You are more likely to purchase a dog with health or behavioral issues from a shelter or a rescue than a pet store. Third fact: those choices can include private breeders, shelters/rescue and pet stores. There are three main types of breeders: Professional, Pet and Hobby/show breeders. Every one of these can be a large-scale breeder, every one of these could be a substandard breeder. Professional kennels are subject to state and/or federal oversight. Substandard care can be found with all types of breeders. It is about the standard of care, NOT the numbers. Most Professional breeders who sell to pet stores have state of the art kennels that meet USDA standards and the standards of their state laws. They are inspected at least yearly and must meet or exceed 157 pages of stringent standards far higher than those expected of the average hobby breeder. They are NOT those horrible chicken cages shown on the deceptive commercials of HSUS and ASPCA. If you haven’t visited a commercial kennel you are not an expert on the subject. “Sick” puppies do not sell. Sick females do not conceive and produce puppies. Sick males do not produce sperm and sire puppies. It is counterproductive for any industry to produce a defective product and expect to stay in business. For every sick puppy found at a pet store, THOUSANDS of perfectly healthy puppies are sold. Any dog can have health issues. It’s about Mother Nature NOT lack of care or numbers. Fourth fact: The word “puppymill” was invented by the animal rights groups. The animal rights groups use the word to horrify, terrify, and coerce the public into giving them money. The very people who invented and sling this word around with great abandon are the ones who benefit from “puppymills”. They benefit from begging for donations. They benefit from selling dogs seized in raids. It is totally in their best interest to convince the public that we are ALL “puppymills” who make a living off the backs of our poor little dogs. We are breeders need to STOP using the word invented to destroy us .There are no “puppymills”. Say that to yourself about fifty times. There are NO puppymills. There are substandard breeders. Any profession or hobby is going to have a few bad apples, but we don’t need to help our enemies by using their language to denigrate others. As breeders we need to step up and HELP each other. Extend a hand instead of pointing a finger. If someone isn’t living up to your personal standard maybe that’s about your standard and not them. What they are doing may work for them. You can always make suggestions, share information, try to help. If all else fails, AKC has a new safety net program that can help breeders. If someone gets raided we ALL look bad and the public believes the propaganda. Fifth and final fact: We are all in this together. None of us can climb up on our high horse and claim to be better than. We are all being tarred with the same garbage by the animal rights groups. They don’t believe any of us are good and we know that is not true. If you are breeding to produce the next Westminster winner – good for you. If you are breeding to sell puppies as wonderful pets to the public – good for you. If you are running around with your nose in the air looking down on the breeding program of others YOU are part of the problem. The animal rights groups are USING YOU to divide and conquer all of us. They take the things YOU say and point the finger at others. Don’t think being better than will save you if you land in the sights of a determined animal rights fascist. They will come after you too. Just remember most members of the public just want a healthy puppy. They don’t care how many champions are in the pedigree or how many ribbons you have won or even how many health tests you do. They just want a pup to love and as breeders we should be just as PROUD to produce those pups as we are that Westminster winner. The love of dogs is what it is all about. Elizabeth Brinkley has been involved in the sport of dogs for 49 years starting out as a 4-H kid with the family pet. She is a Legislative Liaison to the American Kennel Club, a Delegate to the Virginia Federation of Dog Clubs and a member of the NAIA. She says “I have spent most of my life raising, training and showing dogs. I have taken enough classes, workshops, seminars and symposiums to earn at least a Bachelor’s degree and while earning my five college degrees in other fields I have taken college classes in biology and genetics.” She earned a national certification through NADOI as a dog obedience instructor and has worked in vet offices, animal shelters, grooming shops and boarding kennels. Gordon Setters Need To Play Games! Source: Gordon Setters Need To Play Games!